We've got an updated information resource for you to brand and share with clients, prospects and COIs. I think you're going to like it based on some early feedback. It's called the Healthcare Quick Reference Guide. It has just been produced and reviewed by FINRA. Like it or not, we've got to face the fact that healthcare is a critical aspect of people's financial lives, whether they're start-up entrepreneurs, midlife professionals, pre-retirees or retirees. There's no getting around it. Changes have been made on this topic and the public—your clients, prospects, strategic allies (even your friends and family) may still be confused. This is your opportunity to provide them with the key information that they need to make smart healthcare decisions. Healthcare is on people's minds. Whether they're over 65 or under 65, it's totally in play and people need someone who can offer a simple, clear, objective roadmap of what to do next and how to pick the health insurance plan that fits them best. The problem is we live in a “low information” society. You already know the woeful state of the public's knowledge about investing and the economy. Well, it's just as bad with healthcare insurance. Right now, people are still trying to understand how healthcare reforms affect them and what actions they can take to get the best coverage. So what's the role of the Financial Advisor in this picture? Changes to Medicare premiums and deductibles also create confused clients that need your help. Of course, each year there are nearly 4 million new enrollees (Baby Boomers who have turned 65) who need to understand Medicare's alphabet soup of coverage: Parts A, B, C, and D. They'll also need to understand how Medicare will work with their private insurance, and how their current employment situation will affect their health care decisions. You have a giant swath of clients and prospects grappling with how and what to do about healthcare in 2017. And who will they turn to for guidance? But that's the same position many of us were in five years ago when the first Baby Boomers were crossing the 62 mark. Suddenly questions started coming in to advisors about Social Security and how it fit in to people's retirement. Health insurance questions will be next. We hear every day from top advisors who get it. They've begun to include information about Social Security and Medicare in their client communications, workshops, newsletters and one-on-one meetings. Few expected to be doing that when they started in this business. That's why I want to introduce you to Horsesmouth's Healthcare Quick Reference Guide. You can see a PDF sample here. It's kind of like Key Financial Data but for health insurance issues. What's in the Healthcare Quick Reference Guide? The reference guide, which includes space for you to add your photo, logo and contact info, is an 8½" x 11", two sided resource; hard copies are printed on card stock. It has Medicare premiums, deductibles and enrollment periods on the front and details on Medigap and Medicare Advantage on the back. Each side includes critical information about how to make important health care decisions. Printed, branded card—Mail or hand out now. Order the Healthcare Quick Reference Guide. Because it demonstrates your leadership. By providing the Healthcare Quick Reference Guide, you're showing clients and prospects that you see the big picture and care that they're informed about this aspect of their lives. Because it affects a wide range of clients and prospects. Even the wealthiest of pre-retirees with their own private coverage still need to know why and how to apply for new healthcare services, especially Medicare. Because healthcare insurance is a serious retirement planning issue. Right now, a couple approaching retirement is expected to spend at least $500,000 in healthcare expenses during retirement. Most people don't realize this, including many advisors. Because it helps clients start thinking about the transition to Medicare. Medicare is complicated and changes every year. 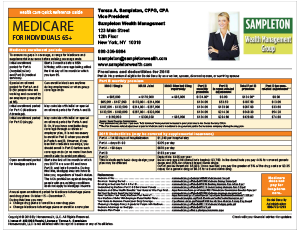 All retirees must familiarize themselves with Medicare. Because it's an easy to implement and very useful communication and marketing campaign. Your clients won't be getting this from anyone else. Relevance rules in this game. One meaningful client touch is all it takes. Because it's safe to assume many clients know nothing about their future healthcare needs. Yes, it's been all over the news for a while. But that's background noise. When people actually see your Healthcare Quick Reference Guide, it may be the first time the new health information has actually crossed their path. They'll appreciate it. You can't be an expert in everything, but you can be proficient in knowing the right questions to ask to get people started in unlocking their future healthcare needs. Here are some ways we recommend you use the Healthcare Quick Reference Guide. Post short items from it to your LinkedIn or Facebook or other social media accounts and link to the full card PDF. Send a printed batch to your physician or other professionals around town. Ask if you can put some up at your local fitness center or other similar places. Keep a stack in an acrylic dispenser in your office lobby. Hand out in any meetings you have with clients and prospects. Share copies with local centers of influence—and not just CPAs and attorneys but also alternative medicine professionals you know such as massage therapists, chiropractors, acupuncturists, yoga studios, pilates studios, etc. 8) Share at local health fairs and other community events focused on health. Just as advisors tell us that they love having the Key Financial Data Cards to share with clients, prospects and colleagues, the Healthcare Quick Reference Guide will have a similar impact. It gives you a concrete reason to have a professional exchange with people. So now, we're offering the Healthcare Quick Reference Guide branded with your name and contact information. Branded PDF for instant use with clients and prospects starting right now. This client communication program is all about you keeping in touch and letting them know you're on the case as events and facts change—which they will! 100 Branded, Hard Copies (Printed) of the Healthcare Quick Reference Guide that you can send in the mail, hand out in person and include in any other client or marketing campaigns. 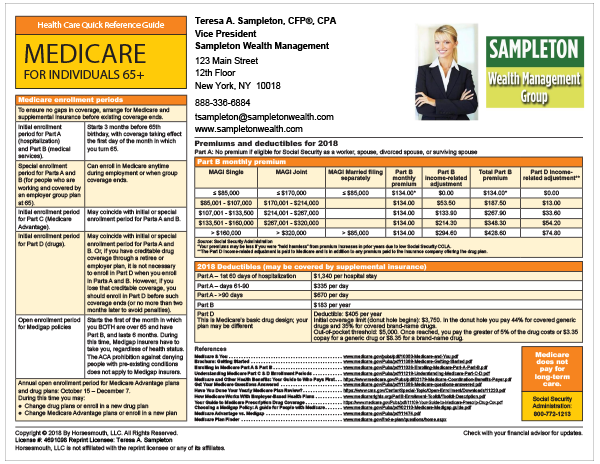 The branded, coated, 8½" x 11" Healthcare Quick Reference Guide is the type of client handout that reinforces your reputation as a client-centered, forward-thinking advisor.